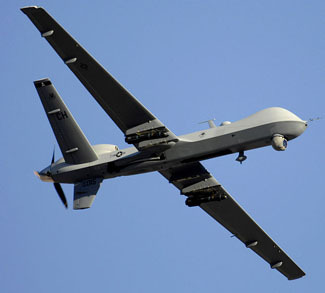 US drone strikes have long been a sticking point in US-Pakistan relations. To the Obama administration, they are a key tool in the fight against terrorism, evident in the various high-ranking commanders they’ve eliminated from the regional militancy equation. To Islamabad, however, they represent a breach of state sovereignty, and their tendency to kill civilians serves to undermine government writ in Pakistan’s tribal territories. If drone strikes are the crack running along the edifice of US-Pakistan relations, then US aid is the plaster used to mask it. The Obama administration quietly resumed a $1.6 billion military aid package to Pakistan last month. On hold since the 2011 Osama Bin Laden raid, the resumption suggested that Pakistan’s new Nawaz Sharif administration would defer back to the old dynamic of “US strikes, Pakistan condemns” with regards to the issue of extraterritorial drone strikes. And it might have done just that if not for a case of poor timing. Last week, after four years of trying, the US managed to kill Hakimullah Mehsud, the leader of the Tehrik-e-Taliban (TTP), in a drone attack in North Waziristan. The strike came days after Prime Minister Nawaz Sharif announced that government negotiators were headed to the tribal areas to initiate a peace process; and weeks after Hakimullah himself told the BBC he would be willing to negotiate with Islamabad (albeit pushing an inflexible demand of establishing Sharia law throughout Pakistan). All this serves to increase the potential severity of diplomatic fallout from the Hakimullah strike. Prime Minister Sharif has essentially left himself with no other option than to come down hard on Washington. He has already organized various high-level meetings with his army chief of staff and diplomats, with a stated aim of re-assessing Pakistan’s relationship with the United States. Opposition parties are also fanning the flames. Imran Khan’s Pakistan Tehreek-e-Insaf (PTI) is calling for another blockade of NATO supply lines into Afghanistan, even threatening to act independently in its capacity as ruling party of Khyber-Pakhtunkhwa. The prospect of another shutdown of supply routes through Pakistan would probably be taken seriously by the Obama administration, as these routes are expected to play an important part in the scaling down of NATO troop levels in Afghanistan over the next year. Prime Minister Sharif has yet to comment one way or another on the PTI plan. A more likely result in the short term however is that the new leader, whether Khan Said or Asmatullah Shaheen Bhittani, will defer to the more tried-and-tested method of going on the offensive to consolidate support within the movement. Peace offers, particularly those involving major concessions, generally extend from leaders with the personal authority to silence inevitable dissenters within their organization. Ironically enough given his brutal modus operandi, Hakimullah Mehsud was more of a fit for peace than whoever his successor will be – at least for the time being. via The Strike that Rattled US-Pakistan Relations – Geopolitical Monitor. By https://olduvai.ca in Asia, Geopolitical, U.S./Mexico on November 6, 2013 .